Vietnam and Cambodia have put out to tender a project on national border map making between the two countries. Senior Minister of the Royal Cambodian Government Var Kim Hong. 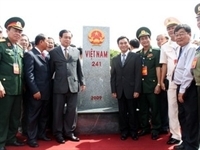 Vietnam and Cambodia are scheduled to fulfill all border demarcation-related work by 2012.